It’s important that you select the right forklift for the jobs at hand. We will help you every step of the way… and together we’ll determine the appropriate forklift for your needs. Getting clear on which forklift is best for you in the early stages saves time and money further down the track. 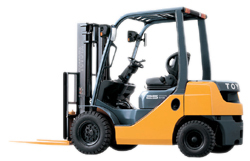 Lift trucks are a safe and ideal way to lift products. You’ll need to know how high the truck will need to lift (usually in metres). It’s a good idea to check door widths and heights too, some forklifts do not fit through standard doorways. Also check aisle widths and any overhead obstructions. Try and foresee any other challenges, for example, has the forklift got enough room to turn around? In order to get the correct truck you will need to know the maximum weight that you intend to pick up. Think about all the dimensions of what you are lifting so as to determine the correct fork width and length. Think about the terrains that the truck will travel on; concrete, tarmac, gravel, grass, dirt, mud (building sites) etc. Cushion tyres are smaller and made of a hard rubber compound and are best used for hard surfaces, mostly indoor – these units are usually more compact and manoeuvrable. Pneumatic tyres are bigger and have deeper tread and better grip. They are ideal for rough surfaces and are generally used for outdoor – even wet conditions. Where and how will the forklift be delivered? Is the delivery point a loading dock with height or is there a ground drop – are there stairs, elevators – these all need to be measured. If you have any other enquiries, or need something urgently , we are happy to help. Alternatively, to get started please complete and submit the form on our contact page.